A Roman copper-alloy as of Hadrian (AD 117-138), dating to the period AD 119 (Reece Period 6). BRITANNIA (in exergue), [PONT MAX TR POT COS III], S C reverse type depicting Britannia seated facing, resting head on right hand and holding sceptre, large shield to right. As RIC II, p. 412, no. 577A. 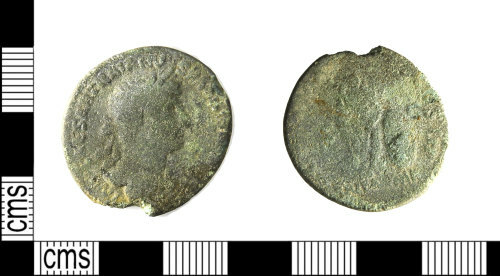 This is a coin of British Association, struck in Rome for issue in Britain - 39 specimens were found in the Sacred Spring in Bath (As Walker, 1988: p. 291, nos. 1-39, pl. XXXI).